OLRG Directory | That Was an Accident! 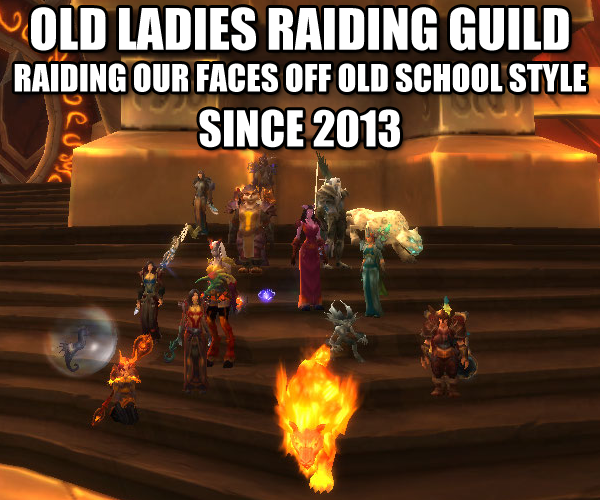 The Old Ladies Raiding Guild conquers old school instances in the name of transmog every Saturday evening. If you’d like to join us, please contact Matty at her blog! We are an equal opportunity derper, so men, youngsters and people who don’t know how to raid are all welcome. Blog: That Was an Accident! Is Typically: Pulling something – wait, you didn’t want to pull yet? I would predominantly hop on as Tumunzahar or if it’s Horde side then Saintvache. alliance eh? I don’t have a high enough toon to even beg for the company but looks like terrific fun. If you ever go horde side lemme know!